Game of Thrones has quickly grown to be the most popular television series the world has ever seen. Game of Thrones was originally written as a series of novels by author George R. R. Martin before being picked up by HBO and built into the instant classic we now all know and love. It’s now available in slot form to play for real money at the leading online casino sites – we explain how. This epic tale of several families battling for power, love, survival and control of the Iron Throne is completely enthralling. Entering its sixth season, we thought it was time we here at OnlineCasinoWebsites.com had a look at the Microgaming epic Game of Thrones online slots. The Game of Thrones concept, like the show itself, was so vast that Microgaming couldn’t simply contain it to one game and released two different versions: a 243 ways online slot and a 15 pay line pokie. The details for each Game of Thrones slot format are detailed below. 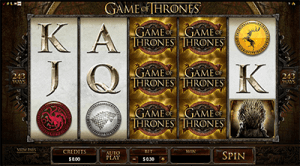 Game of Thrones is a five reel online slot that can be played in either a 243 ways mode or 15 pay line mode. It can be played for free in practice mode or for real money bets at any of our promoted Microgaming powered online casinos. If you’re a complete newbie to the world of online slots, read our beginners guide here. The first thing you notice about the Game of Thrones online slot is the background music is the same iconic music from the opening credits of the hit HBO TV show. This aspect alone gives you the feel of setting foot in Westeros. The graphics are crisp and sharp, while gameplay is simple and easy to use. And to top it all off, Game of Thrones boasts a gamble feature too. This is an option available after the end of each winning spin. In descending order of value, the symbols in the Game of Thrones slot are the yellow Baratheon family crest, the red Lannister family crest, the white Stark family crest and the red Targaryen family crest, followed by Ace, King, Queen and Jack. The Game of Thrones insignia acts as a wild symbol and comes stacked, which is a great aspect of the game. The Iron Throne symbol is a scattered feature trigger. Spinning two Iron Thrones awards you a random cash prize, multiplying your original bet by 1x up to 100x. When any three or more of the scattered Iron Throne symbols appear the feature is triggered. From the normal playing screen you are taken to a screen with four flags. Each flag bares the house emblem of one famous family from Westeros and each flag represents a different feature option you can choose from. The Baratheon flag offers you eight free games, a 5x multiplier and three Baratheon symbol stacks. The Lannister flag offers you 10 free games, 4x multiplier and four Lannister symbol stacks. The Stark flag offers you 14 free games, 3x multiplier and five Stark symbol stacks. The Targaryen flag offers you 18 free games, 2x multiplier and six Targaryen symbol stacks. Stacked symbols as well as stacked wilds makes for massive possible payouts. Another thing we love to see from our online slots is the feature can be re-triggered during free games. All in all, Game of Thrones 243 ways or 15 lines is a generally standard outing from Microgaming. The only thing we would like to see from Microgaming here is more clips from the series itself. Seeing heaps of action clips from the show would really take this game to the next level and solidify its place as an instant classic. GoT fanatics can play the Game of Thrones slot game at all Microgaming powered casinos, including our favourite, Jackpot City, where new players can claim a welcome bonus of up to $1600 when playing for real money.